Last fall after visiting an exhibition of medieval manuscripts I wrote about how I longed for an illuminated missal. 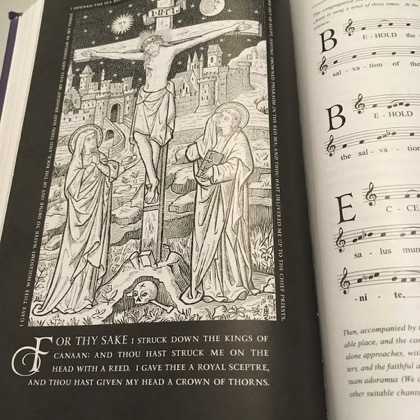 In the comments to that post someone suggested I investigate the St Isaac Jogues Illuminated Missal. I checked out their website, which has some sample pages, and liked what I saw. 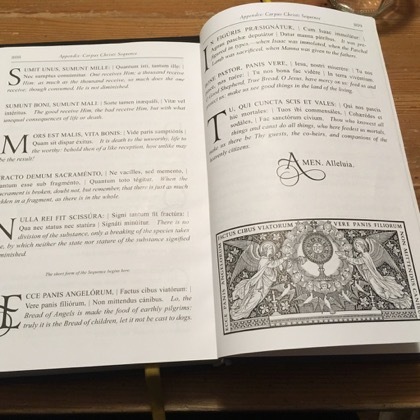 It’s not exactly what I envisioned, but it is a beautifully made missal and comes closer than I dared to dream. We bought a copy and Bella has been bringing it to Mass with her every Sunday. She loves it and we plan to buy a second one soon for Sophie. I didn’t write about it right away because I wanted to spend some time looking at it and using it. And then somehow I forgot that I hadn’t written a review. 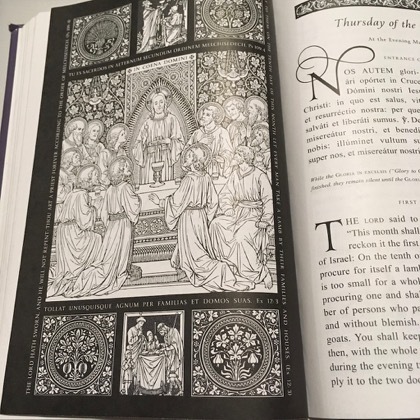 Then recently a friend saw a picture of Bella with the missal and asked what the book was. I went to find my review and realized there wasn’t one. So that means it’s time to write one. No, it’s not the same as a hand-written illuminated medieval manuscript. Of course. But it’s a very well-made book and it’s clear that the publishers put a lot of thought into fonts, page layout, and design. I would have liked more full color pictures, but I realize those are more expensive and they probably had a particular price point they were aiming for. So realizing that this is a book with some compromises, but absolutely lovely for all that. Much more than I really could have hoped for. The one element I didn’t like was the photographs of the priest at Mass that are included in the Eucharistic prayer. To me photographs are pretty much the antithesis of what I was aiming for and from the first they seemed discordant. I don’t feel they are in keeping with the sensibility of the rest of the book. And yet…. Bella really likes them and I noticed that when the children were playing Mass and she was reading the priest’s prayers she was using the photographs to help her with the gestures. 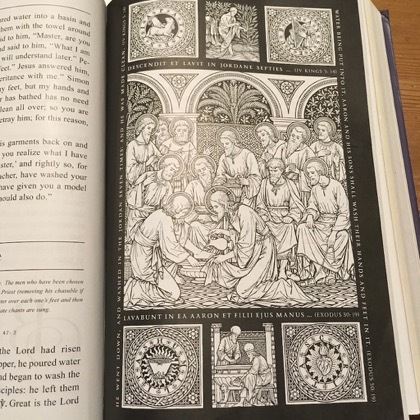 And my dad liked them to, seeing them as a guide to help orient the reader toward what is going on, and a way of asserting that gestures are as much a part of the prayer as the words. Kids playing Mass. Bella says the Eucharistic prayer. The alternation of full color illuminations with black and white woodcuts is actually rather pleasant. I like the attention to font and paper and layout. I especially like the Latin and English texts side by side– and so does Bella. 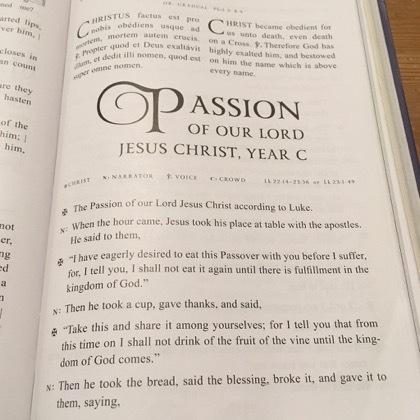 When I took the children to the Triduum services this year we had to get there early to get seats and there were some fairly long stretches where the children had to wait patiently. 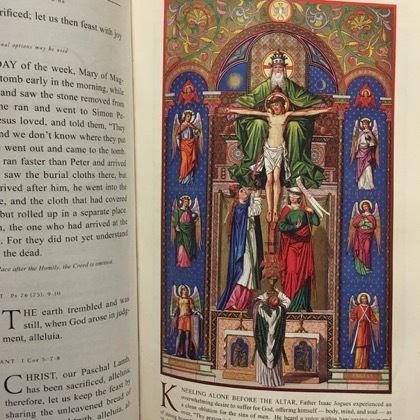 I noticed Bella sharing the pictures in the Missal with Ben. Likewise, I’ve seen her entertain Lucy by showing her various pictures. 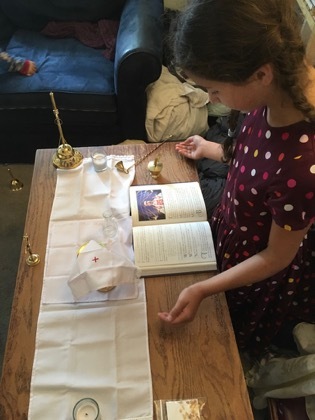 What is lovely about that is that in this case the pictures aren’t a distraction from Mass, but a means by which the children can contemplate the mysteries of the Mass, an aid to prayer and meditation. 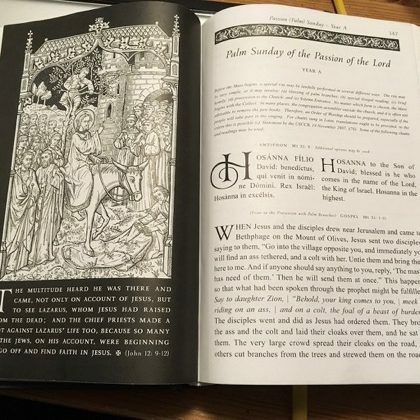 These missals seem to be intended primarily to be marketed to churches to be the missal in the pew instead of the disposable missalettes which need to be replaced every year. But it also is lovely as a personal missal. 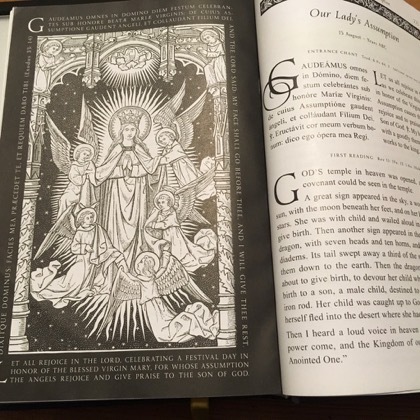 It would be a good missal for single people, for parents– mom or dad will find it not only gives them pictures to meditate on, but also is a great aid for distracting toddlers and engaging squirmy little ones. 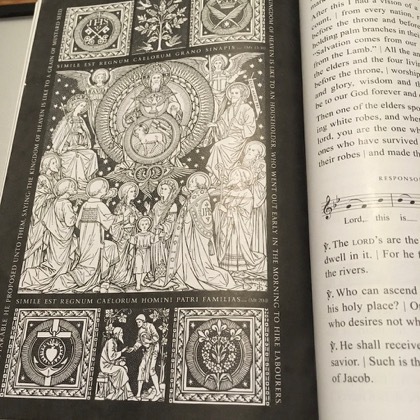 I also highly recommend the Isasc Jogues missal not only for the intended adult audience but also for older children. It would be a lovely confirmation gift as well.